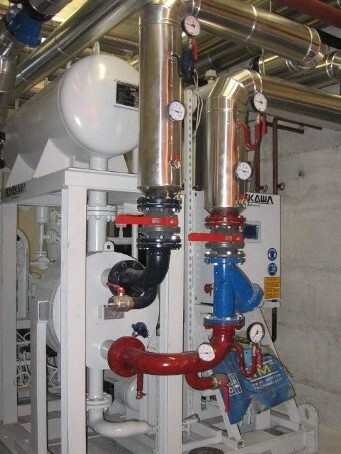 A new generation of energy saving equipment, with natural refrigerant NH3 (GWP=0). The heat pump enables efficient use of low temperature sources of energy and increases use of renewable sources of energy. It decreases of costs for high temperature heating and lowers CO2 emissions. The heat pump produces hot water up to 85˚C with high COP (even up to 9). 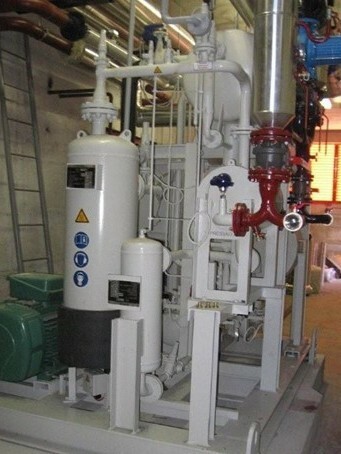 Four types of high-temperature heat pumps are available: 500 kW, 1.4 MW, 4.4 MW and 9.8 MW. Geothermal water temperature up to 55˚C. Low temperature sources of industrial processes. Heat of sea water, lakes, rivers etc.